An ancient prophecy that could remake the political and magical landscape of the Five Nations provides the foundation for Wyatt's Dungeon and Dragons-based fantasy adventure set in the Eberron game world. The half-elf seer Gaven, whose dire and cryptic predictions earned him a cell in the dwarven prison Dreadhold, suddenly finds himself freed by a man he doesn't trust. Haldren ir'Brassek, formerly a nobleman, was imprisoned himself in Dreadhold for war crimes committed during his own search for power. 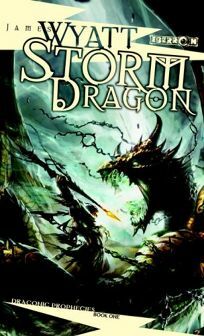 Now Haldren needs Gaven's knowledge of the prophecy about the mighty Storm Dragon in order to help the dragon Vaskar gain power. Gaven, who bears the Mark of Storm, signifying great magical talent, does his best to foil Haldren, first by lying and then by escaping to seek his own answers to the prophecy he can't seem to escape. The key to everything seems to be the Eye of Siberys, a magical artifact Haldren and Vaskar will do anything to possess. While the setting may be rather confusing for readers unfamiliar with the Eberron milieu, Wyatt (In the Claws of the Tiger) effectively mixes political intrigue with action. This high-stakes adventure, full of violence, magic and suspense, should entertain gamers and epic fantasy fans.